Oscar Mauterer was born on August 24, 1925 and joined the Armed Forces while in Charlottesville, Virginia. He served in the United States Air Force, 602nd TFS, and attained the rank of Colonel. Oscar Mauterer is listed as Missing in Action. There is a "In Memory Of" stone in his name in Arlington National Cemetery. Charlottesville VA - then corrected to Gilette NJ. After family contact and paperwork, Home of Record was found to be UNION NJ. When North Vietnam began to increase their military strength in South Vietnam, NVA and Viet Cong troops again intruded on neutral Laos for sanctuary, as the Viet Minh had done during the war with the French some years before. The border road, termed the "Ho Chi Minh Trail" was used for transporting weapons, supplies and troops. Hundreds of American pilots were shot down trying to stop this communist traffic to South Vietnam. and the recovery rate was high. Still there were nearly 600 who were not rescued. Many of them went down along the Ho Chi Minh Trail and the passes through the border mountains between Laos and Vietnam. One of the aircraft which operated along the Trail was the Douglas A1 Skyraider. The "Spad" is a highly maneuverable, propeller driven aircraft designed as a multipurpose attack bomber or utility aircraft. The E model generally carried two crewmen. The A1 was first used by the Air Force in its Tactical Air Command to equip the first Air Commando Group engaged in counterinsurgency operations in South Vietnam, and later used in a variety of roles, ranging from multi-seat electronic intelligence gathering to Navy antisubmarine warfare and rescue missions. The venerable fighter aircraft was retired in the spring of 1968 and had flown in more than twenty model variations, probably more than any other U.S. combat aircraft. Mauterer apparently ejected safely, and there is reason to believe he was captured by the enemy. Whether that enemy was the North Vietnamese who regularly streamed down the Ho Chi Minh Trail, or their Lao communist allies, the Pathet Lao, is a matter for speculation, but some reports point to capture by the Lao. Airmen" whom the Pathet Lao were "treating correctly and who were still in Laos. Another name, Norman Morgan, captured January 9, 1968, was mentioned but is not on lists of missing. This is believed to correlate to Norman Green, lost on January 9, 1968 in Laos. Mauterer was never classified Prisoner of War. Few lost in Laos ever were. Like Mauterer, many were alive on the ground and in radio contact with search and rescue and other planes; some were known to have been captured. Hanoi's communist allies in Laos, the Pathet Lao, publicly spoke of American prisoners they held, but when peace agreements were negotiated, Laos was not included, and not a single American was released that had been held in Laos. Were it not for the thousands of reports concerning Americans still held captive in Southeast Asia, the Mauterer family might be able to close this tragic chapter of their lives. But as long as Americans are alive, being held captive, one of them could be Oscar Mauterer. It's time we brought these men home. During the period he was maintained missing, Oscar Mauterer was promoted to the rank of Colonel. RATIONALE FOR SELECTION: Major Mauterer made a successful ejection from his aircraft and made a good landing. Two sources reported his possible capture by North Vietnamese security forces. There are no correlated reports of his death since the incident. 1. 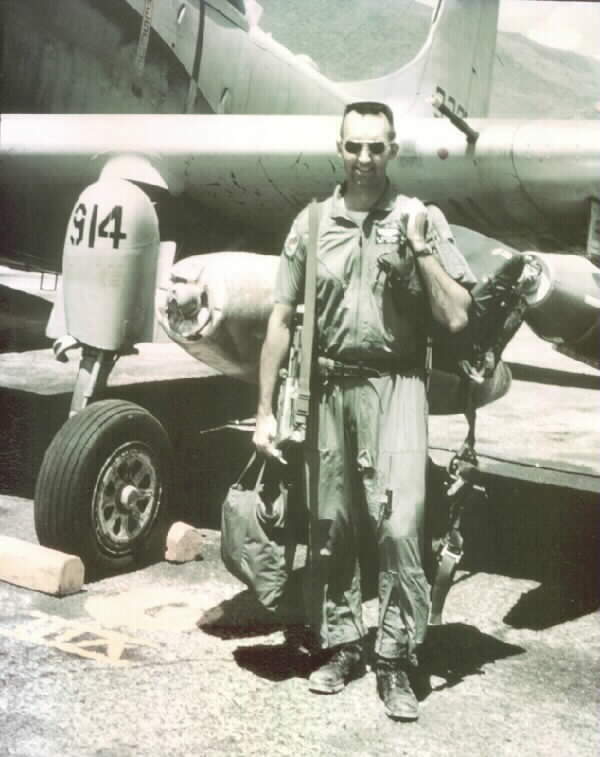 (U) On 15 February 1966, Major Oscar (NMN) Mauterer was a pilot of an AIE aircraft (# 52-133885) as wingman in a flight of two which was providing cover for two O1E Forward Air Controller (FAC) aircraft over Laos. The flight had completed three attack runs on the target and were about to depart the area when Maj Mauterer radioed that he was on 'Lire and was going to bail out. The flight leader observed a good parachute and circled until it reached the ground in the vicinity of -rid coordinates WE 761 257. When the flight 'leader made a low pass to look for Maj Mauterer on the around the FAC observed ground fire from around the downed pilot. 4. (U) During- the existence of JCRC, the hostile threat in the area precluded any visits to or ground inspections of the site involved in this case. This individual's name and identifying data were turned over to the Four-Party Joint Military Team with a request for any information available. No response was forthcoming. Maj Mauterer is currently carried in the status of Missing.